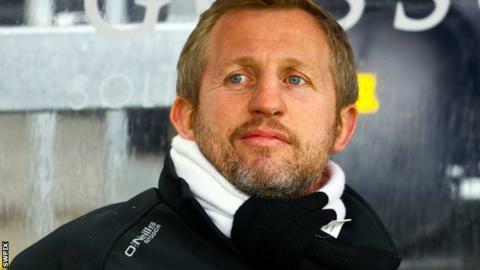 Widnes Vikings head coach Denis Betts described reaching the play-offs for the first time in the Super League era as a "fantastic" achievement. The Vikings have made year-on-year progress since their top-flight return, ending last season 10th following a bottom-of-the-table finish in 2012. Sunday's win at Bradford ensured a top-eight place in 2014. "It's a fantastic feeling knowing we've achieved what we've set out to do," Betts told BBC Radio Merseyside. "We knew we wanted to finish better than we did last year, we knew that everyone expected us to finish in the bottom two or three teams fighting it out." Just five winter arrivals bolstered Betts' squad for the campaign, while three departed as Widnes retained faith with much of the squad from the previous term. Players such as Kevin Brown, linked with interest from the southern hemisphere NRL, Joe Mellor and Rhys Hanbury have been cornerstones of their league success, in a season that also brought a Challenge Cup semi-final appearance. "To grow as a team, and not to have made massive changes and finish the season as strong as we have is testament to the players," Betts added. Betts' side complete the regular season against Salford on Friday and could finish as high as seventh if they better Catalans' result at home to Castleford.